1 July 2014. The Agency for Healthcare Research and Quality, a division of the U.S. Department of Health and Human Services, issued a report today indicating a systematic review of published research shows that vaccines are safe and serious adverse reactions to vaccines are rare occurrences. The study, conducted by the Southern California Evidence-Based Practice Center, a consortium of the Rand Corporation in Santa Monica and four California universities, was also published online today in the journal Pediatrics. Despite the record of vaccines preventing millions of occurrences diseases like polio and measles, increasing numbers of parents in the U.S. are opting out of having their children vaccinated. In addition, target immunization levels for adolescents, pregnant women, and adults overall have still not been reached. Despite voluminous evidence to the contrary, concerns among some parents persist over the safety of vaccines, particularly the link between the measles-mumps-rubella vaccine and autism. The authors note that parental refusals to have their children vaccinated are associated with recent outbreaks of measles and whooping cough. In addition, Centers for Disease Control and Prevention reported in May that the number of measles cases reached a 20-year high, with nearly all cases the result of international travel by unvaccinated people. 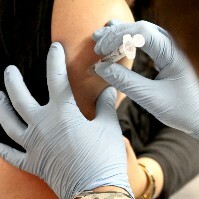 The research team from Rand Corp., UCLA, and Boston Children’s Hospital compiled reports of published studies archived in PubMed, reviews of published studies, information packets from vaccine manufacturers, package inserts, and a 2011 report from the Institute of Medicine that reviewed 1,000 studies and found few health problems caused by or even associated with vaccines. The collection process yielded nearly 20,500 studies on vaccines, from which they identified 67 discussing adverse effects. The researchers then evaluated the adverse effects reported on a standard McMaster Quality Assessment of Harms, abbreviated McHarms scale. The results show strong scientific evidence of no association between common vaccines and rumored adverse outcomes believed by some parents and circulating on the Internet. Among the findings with strong evidence are no connection found between the measles-mumps-rubella vaccine and autism. The researchers also found no connection between vaccines for pneumonia or influenza and cases of heart condition or stroke among the elderly. Likewise, the team found no association between a range of vaccines — including measles-mumps-rubella, diphtheria, tetanus, whooping cough, and hepatitis B — and childhood leukemia. In addition, the researchers found strong evidence, but not quite as conclusive, that there are no connections between human papillomavirus (HPV) vaccines and stroke, seizures, appendicitis, deep vein thrombosis, and the onset of type 1 diabetes and juvenile arthritis. Similar strength of evidence was found showing no association between inactivated flu vaccines and adverse pregnancy outcomes, such as miscarriage, low birth weight, and premature birth, among women who are vaccinated while pregnant. The literature did show rare occurrences of adverse effects from vaccines, such as cases of Guillain-Barré Syndrome resulting from the 2009 H1N1 flu vaccine. The number of cases reported, however, were low: only 1.6 cases per 1 million people vaccinated. While the findings may allay some fears by parents about links between vaccines and adverse effects, the authors suggest instituting a stronger surveillance system, taking advantage of electronic health records and vaccine safety reports maintained by managed care organizations and other large health care providers.